maNavALa mAmunigaL replies to some people who were with him. They posed him a question, “Hey! maNavALa mAmunigaL!!! As per the phrase “nORREn pal piRavi (periya thirumozhi 1.9.8), there are innumerable births for a soul that is manifested in different bodies each time. The births are governed by your karma. You say that you have a lot of karma and so you will have to take births again and again as per the karma. While your state is like this, how can emperumAnAr protect you as you claim? maNavALa mAmunigaL tells those people that he (emperumAnAr) will reincarnate again for his (maNavALa mAmunigaL’s) sake in order to protect from the bondages of samsAram and take him to the eternal abode of SrIman nArAyaNan. maNavALa mAmunigaL tells a few people who were standing near him and told him that it is his karma that causes him multiple births and deaths. One has to experience the karmic effects and only at the end of this karmic cycle can one be liberated. There is nothing that emperumAnAr can do about this regarding your specific case. maNavALa mAmunigaL tells them that a mother will save her child who has fallen in the well, by diving in the same well immediately after seeing her child fall. Similarly, my father emperumAnAr will also save me by reincarnating again, just for my sake. maNavALa mAmunigaL tells an analogy here to begin with. There is a child who has just fallen into a well. Seeing this, what will its mother do? She will jump immediately into the well along with the child in order to save it. maNavALa mAmunigaL uses this analogy to explain to a few people who were standing near him and asked the question as to why and how would emperumAnAr save him (maNavALa mAmunigaL). maNavALa mAmunigaL says, “Just like how the mother saved her child by diving along with the child in the well, adiyen’s father (emperumAnAr) will reincarnate (similar to the mother’s diving) and protect me, which is analogous to the child who has fallen due to its karma”. maNavALa mAmunigaL quotes a pAsuram from thiruvAimozhi here. 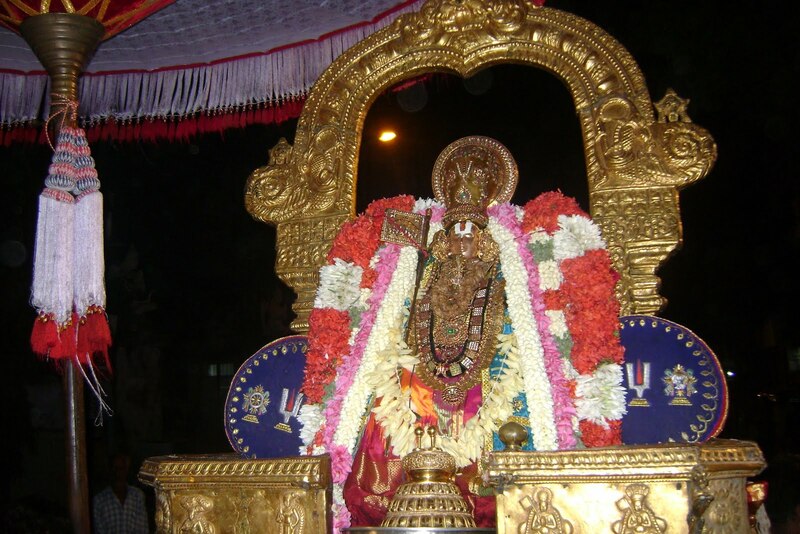 As per “charaNamAgum thanathAL adaindhArkkellAm maraNamAnAl vaikuntham kodukkum pirAn (thiruvAimozhi 9.10.5)”, for a person who has surrendered to the lotus feet of SrIman nArAyaNan, he is ensured of paramapadham when his mortal body falls at this earth for the last time. This is the essence of prapaththi. However, my sins are so cruel that it may even defy the laws of prapaththi and its significance. Even at this extremely difficult and tricky situation, my father (emperumAnAr) would reincarnate himself again as appropriate to my birth. He will engulf me in all directions to capture and protect me from danger as per the phrase “edhir sUzhal pukku (thiruvAimozhi 2.7.6). adiyEn does not have to worry about this as adiyEn is extremely confident of his reincarnation just to protect me. He is my owner and I am his property. The property just falls once but the owner may have to dive multiple times until the property is possessed back”. This entry was posted in Arththi prabandham, Other and tagged arththi prabandham, mamunigal, ramanuja on June 23, 2016 by santhanam rajagopalan.